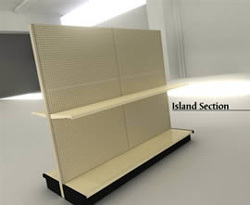 New Aisle Gondola Display Retail Shelving Starter Section - 20" Deep Each Side is perfect for all types of retail stores such as liquor stores, convenience stores, beauty supply and pawn shops to name a few. All units are complete with pegboard, base shelf, post with shoe, dust plates, feet and center supports. Upper shelves are adjustable. Upper shelves are sold separately. The manufacturer's surcharge is not included in the pricing. Specs: 20" depth. Available heights are 48", 54", 60", 72", 84" and 96". Available widths are 36" and 48". 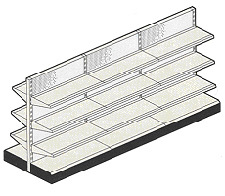 Notify me of updates to New Aisle Gondola Display Retail Shelving Starter Section - 20"